Vice President Faisal Naseem has stated that every citizen should have an equal chance to participate in national development and that the policy of this government is to work together to achieve this goal. He stated this at the ceremony held to launch the Oooredoo smart campus at Maafushi Prison. Ooredoo smart campus is an educational instrument established by the Institute of Correctional Studies of Maldives Correctional Service with the collaboration of Ooredoo Maldives. The instrument will be used to carry out different courses and educational programs of different levels to prisoners in the attempt of rehabilitation through education. This would especially aid in the incorporation of the detainees back in society and make them ready for employment. Speaking during the event Vice President stated that nobody should be sidelined from the society and that the objective of the government is to teach and develop talents of detainees and for them to get out of prison and live a prosperous happy life with their families. 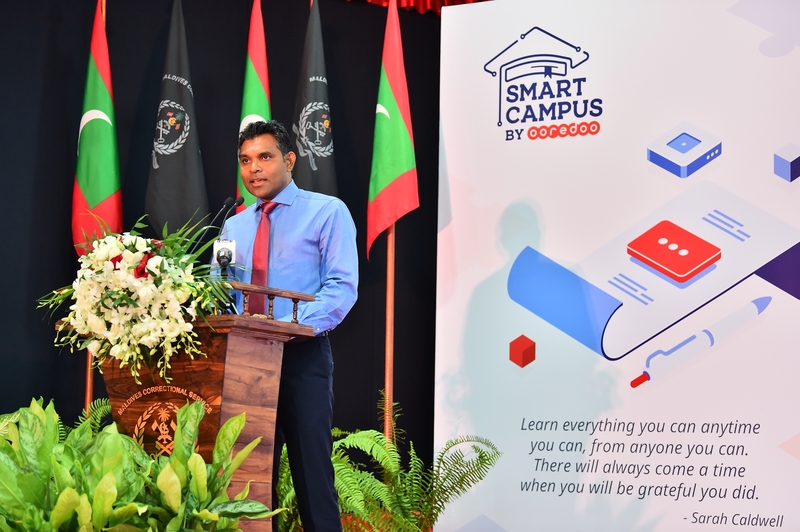 Vice President Naseem also emphasized the government’s policy in developing an educational community and that Ooredoo smart campus is also inclusive of the efforts of the government to promote this target.